In order for you to use all of the outdoor spaces on your property in the best possible way, you may need to excavate and grade the land. This process is vital to the foundation of most landscaping projects and should only be entrusted to trained and experienced professionals. 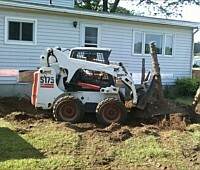 For all types of grading and excavating services, we are the experts to call. We have completed a large number of grading and excavation jobs as part of landscaping projects in Windsor Locks, and Holyoke. For over a decade, our team has assisted countless businesses and residents in Longmeadow, Easthampton, and the surrounding areas with these services. For your lawn spaces to look their best, they must be properly graded. If the lawn isn’t leveled well, this aspect will be strikingly visible at all times and the lawn surface will look uneven. But aesthetics aren’t the only reason why you should focus on having custom yard grading done. The right grading is important in protecting your property. If the lawns slope towards your residence or commercial building, water will flow right up to the exterior walls of your property. This can cause a considerable amount of damage to the below-grade levels such as the basement and the foundation. Properly-graded yard or ground spaces will ensure the water flows very safely away from your property towards the exterior boundary. If you are planning to upgrade any section of your landscape, it’s essential that you hire experienced local excavation and grading contractors for the job. We have the skill, knowledge, and experience to create the appropriate subtle slopes for the various hardscape installations. All features such as patios, decks, pools, fireplaces and fire pit zones as well as terraced areas, walkways, sidewalks, and pathways need level ground. Our experts will level these areas scientifically and expertly.